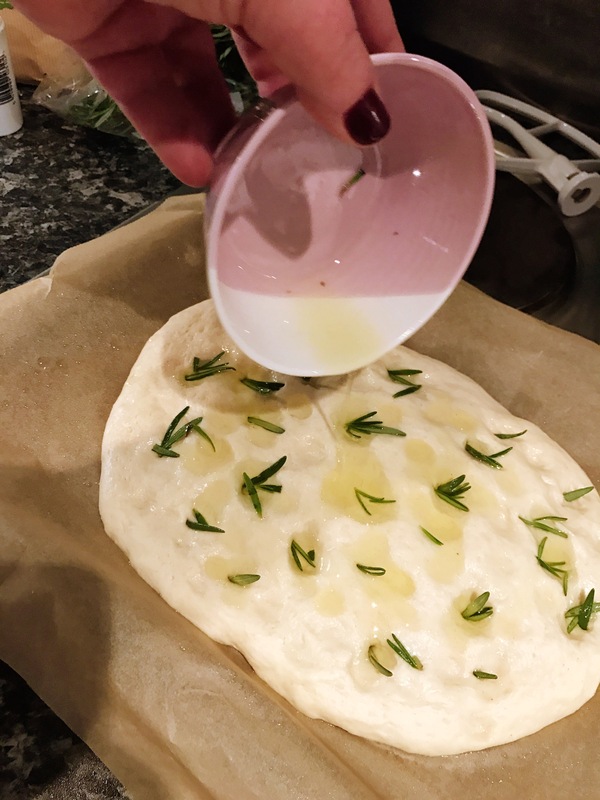 I have been planning to bake some Rosemary Focaccia for about 2 years now. Since the day my friend and housemate Phoebe came home from a long day of chef training at Leiths School of Food and Wine with the most delicious salty loaf of focaccia bread I have wanted to make an attempt at my own. That first slice was amazing and then when she told me that she didn’t want to eat any of it and I could enjoy the whole loaf… well I was in bread heaven. It lasted a day, maybe two at most. 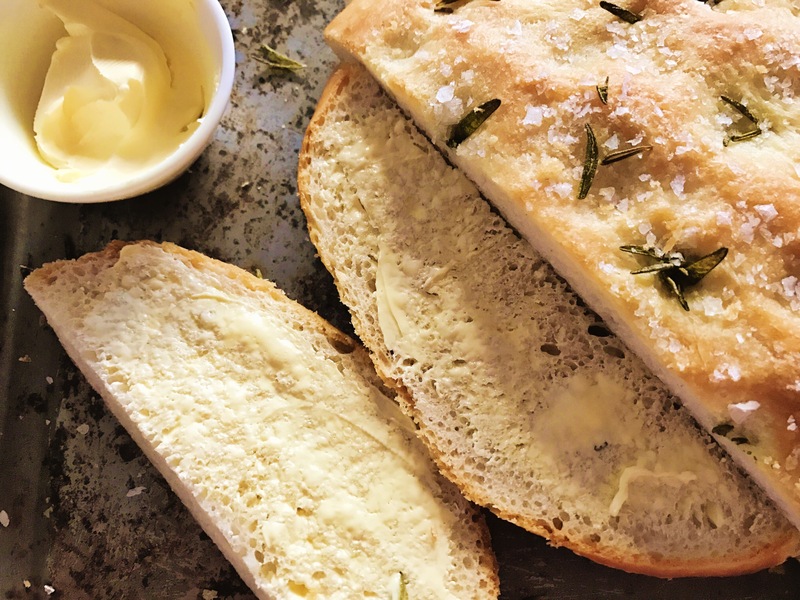 Recently I achieved the dream of owning a KitchenAid mixer and seeing as I have had the ingredients in my cupboard, waiting to be used pretty much since that day Phoebe came home, I thought it was about time I used the dough hook on the mixer and see if I could recreate that scrummy focaccia. The recipe I used was from Leiths How To Cook book and can also be found on their blog here. I really couldn’t find much fault with it. I did make a couple of adaptations that are not mentioned in the recipe, but were on advise from Phoebe (so useful knowing a good chef!) however she had given me this advice two years ago! The recipe is pretty simple to follow with clearly defined steps and was pretty quick even with an hour to prove the dough. The recipe says to use 10g of fresh yeast. I couldn’t find this, so went for fast action yeast. I added this to the flour instead of dissolving in warm water and sifted both into the bowl. The recipe doesn’t say to sift the flour, but on habit I did, as this is something I always do when baking, unless it says otherwise. For me it makes my bakes a little more airy. I also didn’t hand knead the dough, instead I used the mixer with the dough hook. This really took the hard work out of the kneading. I did miss the physical kneading process, but am glad that I didn’t have to clean up quite as much afterwards, especially with the wetter dough of a focaccia. 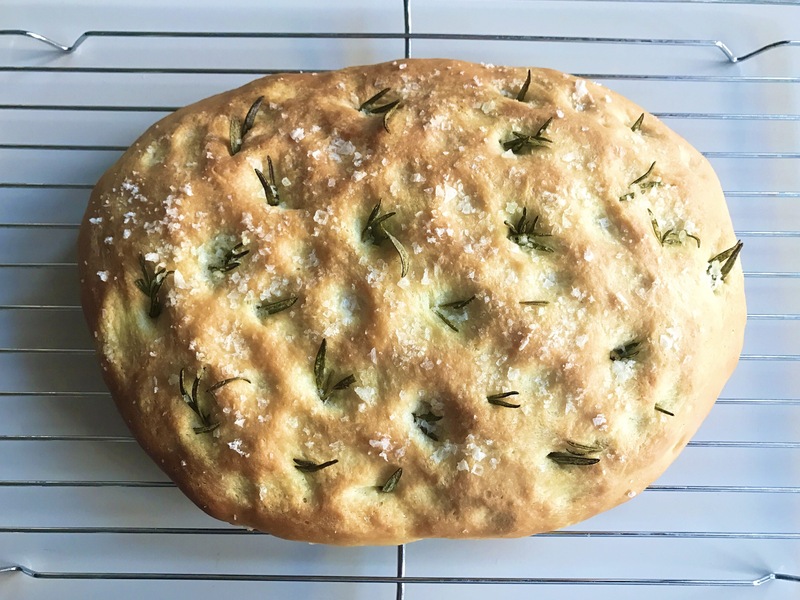 After waiting the hour for the dough to prove and the 20-minute baking time, all the while the flat temptingly smelling of rosemary, I was able to sample my first batch of focaccia. I was not disappointed. 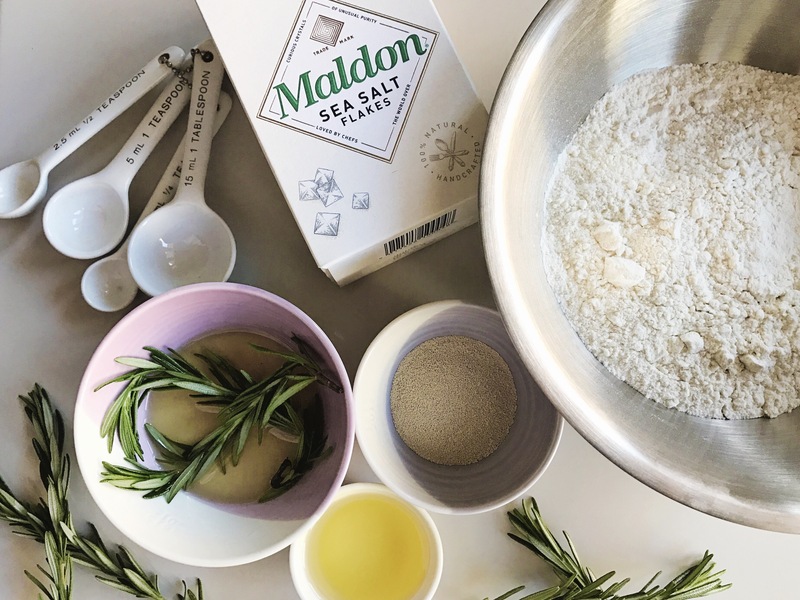 Personally, I felt that it was ever so slightly too salty and when I next use this recipe I would reduce the amount of sea salt that I sprinkle on top of the loaf before baking. My chef on the end of the phone said that if I reduced the salt that was within the dough, most of the flavour would disappear and the yeast needs it, so best to reduce the salt that is on top of the loaf. Other than that it was delicious and have already made my way through a fair amount of the loaf. It is yummy simply with a bit of butter, or you could add some Italian salami to make a little sandwich to take to work with you. 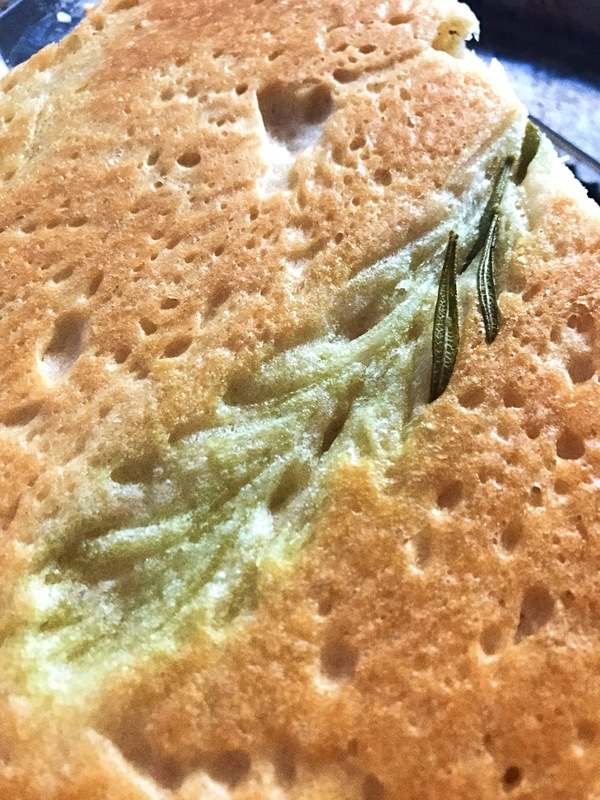 My favourite bit was turning over the loaf and seeing the hidden green indented pattern that a sprig of rosemary had left underneath during baking. When I sent a pic over to Phoebe the feedback was it has “even air bubbles all the way through which shows it has been proved correctly – 5/5.” Sounds good to me! I am really pleased with my first foray into baking bread other than traditional Kosher challah – I have a great recipe for that to share at a later date! My friend Phoebe Saffron Findley is co-hosting a supper club in Leeds on Monday 23rd January 2017 in support of #CookForSyria and it is looking to be an amazing night of Syrian inspired food (wonderfully cooked by her of course), all in aid of a fantastic cause. If you are in Leeds and free, then book yourself a ticket here and there is more information about the event on their facebook page.